The Goddess Legacy is a companion novel to the Goddess Test series. I've read the first two books in this series and have enjoyed, although not loved, them. I picked up The Goddess Legacy partially out of curiosity and partially because it was there. Let me tell you, The Goddess Legacy has entirely changed my feelings about this series. I went from a quasi-admirer to a full-fledged Goddess Test fan girl! The Goddess Legacy is the best book of the series so far and has made the prior two books much more meaningful and interesting. The Goddess Legacy tells the stories of the gods and goddesses who form the backbone of Kate's new life. If you're familiar with Greek mythology, you'll have a basic framework of each character's story, but Aimee enriches the personalities and lives of each one hundred times above whatever you've learned before. Everything about the series makes so much more sense to me now. It's hard to describe each story without giving spoilers for the series as a whole. The synopsis actually does a good job of giving general information without revealing too much. In general, the story makes unlikable characters seem, if not more likable at least more pitiable. The characters who I adored before are still likable, but also more complex and flawed. Almost everything in The Goddess Test series that confused me was based on some unstated fact of the characters' earlier lives. Now, I feel like a part of the family - I get the inside jokes. The Goddess Legacy is set out in four short stories. I've never been a big short story fan, because I find them too choppy. Aimee does a good job of linking all the stories together and making it feel more like one book. There are still points where things are disjointed, but not to the level where it irritated me. My one complaint is probably that is that the characters went by their traditional names, rather than their modern monikers which are used in The Goddess Test. There was a character list at the beginning of the novel, but since I was reading an e-book, it was hard to follow. But I caught on eventually. I highly recommend The Goddess Legacy to anyone who has tried The Goddess Test, even if you didn't like it. 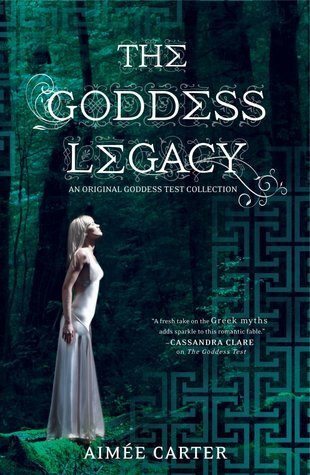 In fact, I think you could read The Goddess Legacy before reading the first two books in the series. It will give away some big secrets of the first book, but will also add layers of richness that you wouldn't understand otherwise. I wasn't the biggest fan of this series but I like that this one focuses on the gods and goddesses. Wonder why they've got their "traditional" names rather than the ones they used in the stories? Definitely hard to flip back and forth in an ebook to look at the list! Aimee Carter is one of my fave authors! I love this short story. Can not wait to read the last book. "Everything about the series makes so much more sense to me now." Well, clearly I need to read this! I hadn't planned on it, but if reading this one brings another layer of understanding to the series as a whole, then I really want to get my hands on it! Despite the few issues I have with Kate and Henry in this series, I still devour each and every book and find myself thoroughly entertained. I can't wait for The Goddess Inheritance! I've been meaning to read this for a while now . . . will need to soon. I can't wait to read The Goddess Inheritance. Nice review! I definitely appreciated this when I read it, but than having read the last book in the series almost feel like this one was forgotten about. You find out so much interesting info during this and the gods/goddesses get so developed and than nothing. :( Definitely worth a read though! I haven't read the series but I do love it when a supplemental book in a series enriches the over all experience. This does make me rethink the Goddess Test series; at first I really didn't think I'd like it because I don't generally like Greek mythology retellings, but this book sounds very interesting. Hi Alison! Nice response, thanks for sharing! I have to read the first installment first. I can't stand to do otherwise, but I will have to make my way to this one for sure. Thanks for the great review. OH! Glad to hear that you liked this one. I bought it over the summer, but I've never gotten around to reading it. I might need to give it a chance now!